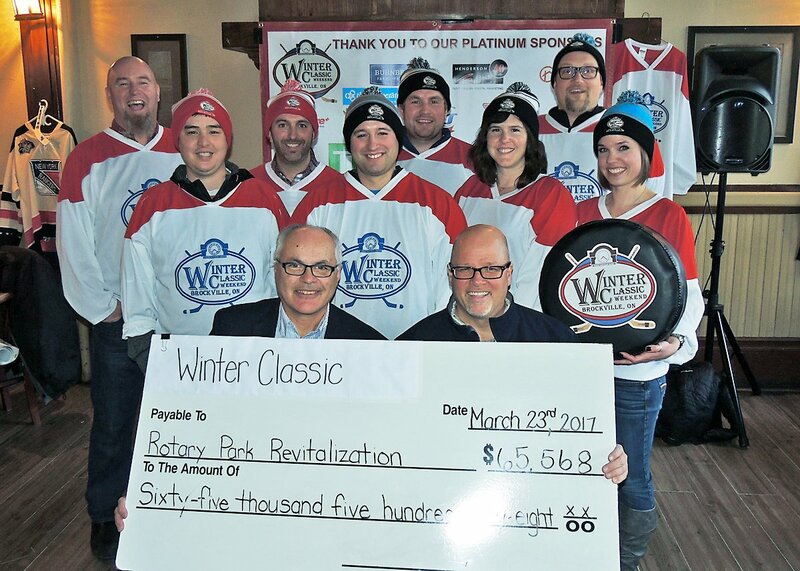 The results are in: the third annual Brockville Winter Classic Weekend scored gold for the Rotary Park Revitalization project. Staged March 3 to 5 by the eight-member classic volunteer committee, the hockey-themed weekend of activities netted more than $60,000 that will ensure an open-air steel roof will be erected over the downtown outdoor public skating rink this year. While some fundraising amounts were still coming in, classic committee member Jeff Severson said a cheque for more than $60,000 would be presented to the revitalization committee on Thursday, March 23. The celebration and appreciation night for committee members, volunteers and platinum event sponsors took place at the Keystorm Pub.The cheque ended up being in the amount of $65,568. The weekend featured family-centred activities and hockey games showcasing the Boston Bruins alumni playing alongside homegrown teams in mini-tournaments, as well as at a sold-out game against the local Canadian Tire All Stars at the Brockville Memorial Centre. And with organizers still enjoying the glow of the successful weekend, they have already secured the headlining team for the fourth annual event: the New York Rangers alumni team. That classic weekend has been slated for Feb. 16-19, 2018 to coincide with Family Day. “They are going to build their tour around us,” Severson commented of the Rangers’ appearance. “It’s Family Day weekend; it’s everything we want.” Because of the positive feedback and achievements this year, organizers won’t be straying too far from the formula that generated such a good outcome. But Severson stresses their success isn’t about the money, adding the committee did not have a set fundraising objective. “We just wanted to put on a phenomenal event,” he said, adding that families having fun is the main goal. “Hockey is amazing, but you don’t have to be a hockey buff” to enjoy the weekend, Severson said. “This event is for everybody. You’re building memories.” Other events included a nighttime skating party, autograph signing with the Bruins, a pancake breakfast and broomball. The Montreal Canadiens alumni took part in the 2016 Brockville Winter Classic. Key fundraisers are also looking forward to the fourth annual event in 2018. Severson said platinum-level sponsors who contribute more than $1,000 have also thanked the committee for including them in the event and are looking to help again next year either by volunteering time or donating money. Platinum sponsors were: Real Canadian Superstore, O’Farrell Financial Services, Burnbrae Farms, Upper Canada District School Board-TR Leger, TD Bank, Henderson Printing, Allstate Insurance, Brockville and Prescott Canadian Tire, Keystorm Pub, Allegiant Contracting, Downtown Brockville Business Improvement Area, Hang Ups Picture Framing, Racer’s Edge, Shell Canada and Royal Bank. Stanley Cup-level sponsors were Procter and Gamble and Brent Scott Co-operators Insurance. The roof over the ice rink was a $550,000 project that will ensure free public recreational use of the surface in all weather conditions and in all seasons. Last year, the classic committee raised $67,000 toward the cost of the project; the amount included $25,000 received from the group’s successful Kraft Hockeyville bid. Even though the 200-by-100-foot roof with interior lighting will be in place this year, there will be ongoing operating costs and improvements to the Rotary Park that the classic committee will want to be involved in, Severson added. Previous projects at the park have included a splash pad, accessible playground and washrooms, synthetic ice pad, portable refrigeration system, bicycle pump track, a basketball court and skateboard park. The Brockville Winter Classic Weekend just got more refreshing! Thanks to Molson Canadian, BIG RIG Brewery & Whitewater Brewing co. for joining in on the fun this weekend and serving up delicious brews all weekend long! Check out the promo for when & where you can find these Top Shelf Beers!